Wong Kar-wai’s 1994 film Chungking Express entwines two love stories with a Midnight Express food stall in Hong Kong. In the film, each character’s love is represented by the food he or she eats. 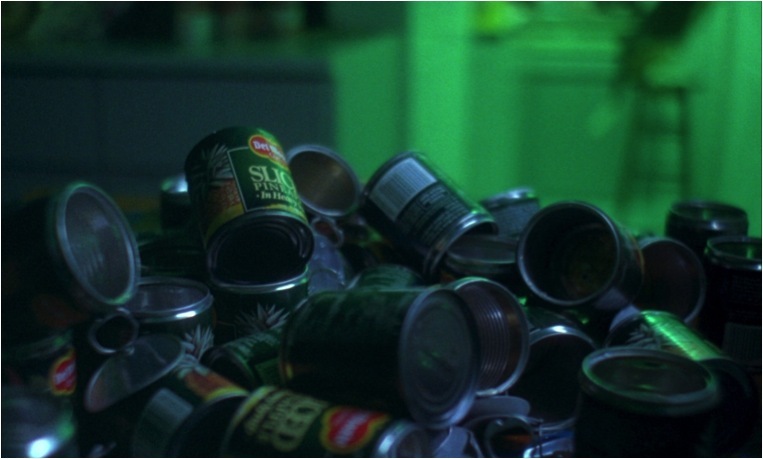 The use of food as a metaphor for love in Chungking Express highlights the melancholic aspects of love: generic flavors that never get any sweeter, sustenance rather than pleasurable flavor, and strictly enforced expiration dates. When the film begins, the first protagonist, He Qiwu, has been left by his girlfriend, May, and he has decided to wait thirty days before moving on, each day eating a tin of pineapple that will expire on the thirtieth day, May 1. Tins of pineapple were May’s favorite food, and thus Qiwu spends that month figuratively consuming his love for her. These tins are an odd metaphor for love, since they are mass produced items with no real aesthetic value, nor uniqueness at all aside from the expiration date printed on them. Since each tin is identical, food, and, by extension, love, is a reduced to an ordinary commodity that can be found at any convenience store, lasts a certain amount of time, and has no purpose other than pure sustenance. As the expiration date approaches, the pineapple tins are steadily going bad, until on April 30, Qiwu cannot find a tin of pineapple expiring on May 1, because the shop has cleared all the old food away. Seeing the waste, Qiwu complains to the owner about how much effort goes into making tins of pineapple, which draws attention to how food goes to waste in the modern world of mass production and expiration dates. Similarly, love doesn’t last forever, and it is an ongoing job to keep creating new instances of it, only to expire in their due time. In exasperation, the shop owner gives Qiwu every expired pineapple tin from the trash, and so, on May 1, Qiwu binge eats every single expired pineapple tin, which he promptly vomits back out. Thus Qiwu symbolically purges himself of the food and lost love in which he’s been floundering. Vomiting is what happens when the tongue and mouth, the romantic organs of kissing, find food edible, but the stomach—the physical core of the human body—disagrees with, and forcibly expels. In Chungking Express, the symbolism is that after a love has run its scheduled course, the body physically expunges all traces of that love in order to prepare space for the next one. After purging his previous love, Qiwu is ready to begin another. During the thirty days, Qiwu was unable to find a new girlfriend, despite constantly calling old acquaintances from the public phone at the Midnight Express food stall. After purging himself of his previous love, however, he makes up his mind to fall in love with the next woman he meets. Since his previous love has “expired” along with the pineapple, Qiwu easily falls in love with a woman in a bar. This relationship does not turn into a passionate or long term affair, since all they do is share a single meal together, and then the woman leaves in the morning. This second relationship shows that one must constantly search for a new love, in the same way that expiration dates force people to eat certain foods at certain times. The passion and romance of love is replaced by a mechanical, scheduled consumption, just like the daily ritual of eating a pineapple tin. In Chungking Express, food, as a metaphor for love, is not flashy or unique, but instead stamped with a date that tells everyone exactly when it will go bad. Consuming the same food past its expiration date will make one sick, which suggests that a melancholy predictability about how people must consume their food, and their love. As a metaphor for love, the presence of food in Chungking Express shows that no romance can last forever. The film raises the question of whether there is a kind of romantic superiority to food made with care, or whether the superficiality is all a ruse to cover the fact that all food is, ultimately, simply sustenance. In the same way, the film leaves it unanswered whether there is ever any permanence or significance to love, or whether it inevitably expires. Chungking Express. Dir. Wong Kar-wai. Perf. Brigitte Lin, Tony Leung Chiu-Wai, Faye Wong, and Takeshi Kaneshiro. Miramax Films, 1994. DVD.